You lords and ladies of armchair avian identification really feasted on our last ID challenge, didn’t you? Apparently, that duck wasn’t as tricky as I had hoped. I believe that part of the problem is that you simply had too much visual information to work with. This next ID challenge may prove more challenging than the last due to the ambiguity of the offered evidence. Elaine Dale of A Scattering sent me a photo that I can only describe as vague. She reports that the subject was large with a light coloured head and light, long tail. 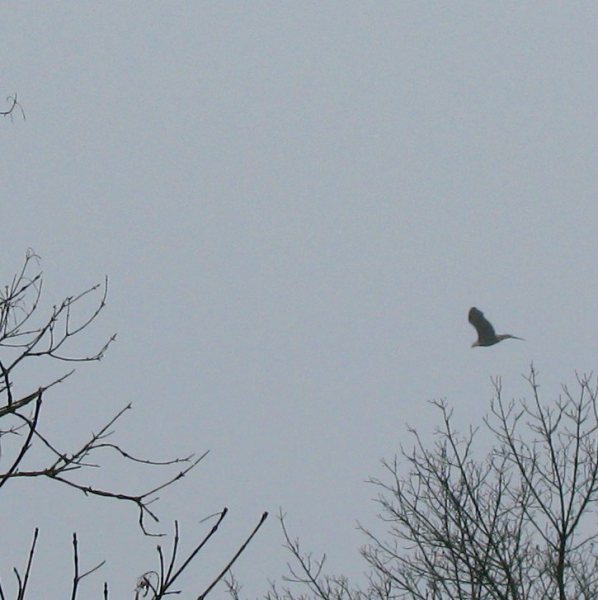 She was walking by a river in Ontario when it flew over. I’d ask for guesses but anybody can make a guess. Instead let’s have some bold assertions as to the identity of this alleged avian! I agree with John, Bald Eagle. Bald Eagle is what I thought, too. Are those falconer’s jesses attached to the feet? Are falconers even allowed to have Bald Eagles in Ontario? Are we supposed to think wader going right instead of eagle going left? eagle for me too but I wonder if we’ve all been hoodwinked. The bird does resemble a snipe if you turn it around but, no, there’s no trick here. Clearly, this challenge was still too easy. Thanks so much for the input everyone, this is a lifer for me! I’ll be sure to watch carefully when I walk this trail again, maybe I’ll get a better shot the next time.